A federal judge in Brownsville sentenced 31-year-old Armando Duenez (DWHEN’-ehz). 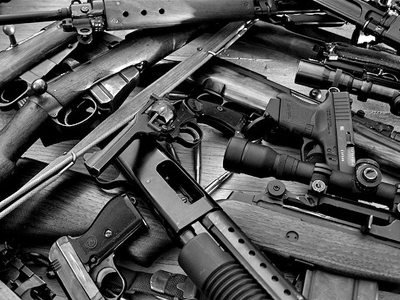 He pleaded guilty in January to conspiracy to export firearms and failure to appear. Investigators say Duenez was a Rio Hondo police officer at the time of the scheme to export rifles from the U.S. to Mexico. Maybe he was the pilot program for Fast and Furious? Because he should have gone to work for the ATF instead. The federal Bureau of Alcohol, Tobacco, Firearms and Explosives, the U.S. Forest Service, and the Carbon County Sheriff’s Office are asking for help from the public in gathering information about the theft of approximately 559 pounds of high explosives from a USFS explosives bunker located near Red Lodge. We’re not talking just blasting agent either. Officials say that various emulsion-type explosives, explosive cast boosters and detonating cord were taken from the facility. How serious is the ATF taking the theft? They’re offering a $5,000 reward. Their warmth and sincerity given the theft occurred with forced entry makes me feel all sorts of warm and fuzzy inside. Doubly so given the propensity of the government, not to mention the BATFE, is more than willing to throw civil rights and liberties to the wind. 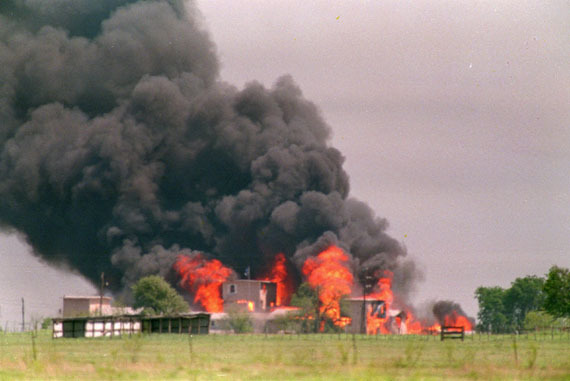 Given today is the 20th anniversary of the end of the Waco siege, it stands to reason that I would place that event on the list. The acts committed this day were horrible and no one was ever held accountable for the decisions and actions that led to the deaths of 76 people, including 27 children. I remember coming home from school that day. I remember going up to my dad while he sat in his chair fixated on the TV. I do not remember what it was I had done that I wanted his attention for. I do remember him promptly picking me up as I started to speak and putting me on his lap while telling me to be quiet. When I looked at the TV, this is what I saw. At the time I didn’t understand what was going on. I didn’t understand what my dad knew happened 8 months earlier. I was in 3rd grade, I had no real concept of the details of what was going on. Later I would receive that education, my dad would make sure I was aware of what I saw in the flickering glow of that television. This day marks one of two major events that molded my relationship with the state. It was a lesson delivered front and center about power and the abuses that can be dealt to citizens without any fear of consequence. I am not putting a number with this. Frankly I’m getting tired of trying to keep track of which number I’m on. Further this event was so horrible and had so many actors one can not easily list them, much less enumerate them. Because by all means kill the victims you claim to be there to save, that’s how you make yourself look good right? Let’s compare and contrast the following two people, what they did, and the reactions by the American Media. 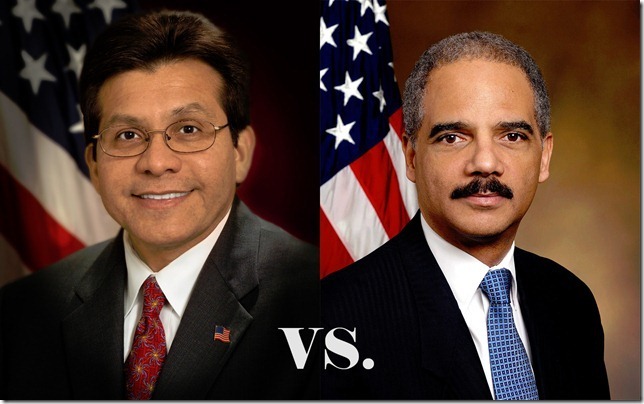 For those who don’t recognize the pictures, on the left we have former Attorney General Alberto Gonzales, on the right we have Attorney General Eric Holder. Both are tied to the highest position within the Department of Justice. Both committed questionable acts while in that position. Both were disliked by large parts of the American people for their actions. Both acted in a manner with the express intent of undermining and destroying enumerated rights. Eric Holder’s decisions resulted in the deaths of both American and Mexican civilians. Eric Holder refused to process cases where the American public was intimidated from exercising their rights. Alberto Gonzales was forced to resign while Holder continues to retain his position. Eric Holder was found in contempt of congress. Eric Holder has not been arrested despite the ability for congress to do so. The Congressional “no-confidence” vote against Gonzales did not succeed. Alberto Gonzales was appointed by President George Bush. Eric Holder was appointed by President Barack Obama. For those who may not remember the details. Here is the quick rundown of the two big scandals under Holder. Comments regarding the American public not having a constitutional right to the writ of habeas corpus. So while the comments and behavior of Gonzales was despicable and worthy of question, why has AG Holder been allowed to remain? There is a man responsible for creating programs with the express purpose of illegally undermining a constitutional right. Programs that resulted in the deaths of members of the public. A man who has been found in contempt of congress, yet no one seems to have the balls to actually fire him. Ultimately the biggest difference between these two is the men who were responsible for appointing them. Because honestly that’s the only reason Eric Holder has been able to continue in his position. Remember that the next time some tells you about how the media isn’t biased. The nation’s top drug and gun enforcement agencies do not track how often they give their informants permission to break the law on the government’s behalf. U.S. Justice Department rules put strict limits on when and how agents at the FBI, Drug Enforcement Administration and Bureau of Alcohol, Tobacco, Firearms and Explosives can authorize their informants — often drawn from the ranks of the criminals they are investigating — to commit a crime. But both the ATFand DEA acknowledged, in response to open-records requests and in written statements, that they do not track how often such permission is given. (Emphasis mine.) When you see it written like that, it reads as the definition of a State Sponsored Criminal now doesn’t it? Because if you want to get a crime, just ask the government for permission first. If you have to sweeten the deal by squealing on your compatriots. No honor among thieves you know. I actually have numerous rule #1’s however the one I’m invoking today is know of who you are talking to, even more so of that of which you speak, especially if someone is offering advice to try to keep you out of jail. Doubly so if they’re also trying to make sure that you realize it is quite possible you could be the cause of a wildfire. So here’s the conversation for those of you who don’t know what I’m talking about. Yes feel free to laugh at the guy who thinks he’s educating Janelle about how explosives work. Aaron, let me enlighten you as to the background of my wife an I. We are both staff for FlashTek. Since you probably don’t know what that is, it’s run by Joe Huffman and is the company that is responsible for putting on Boomershoot every year. Here’s the quick rundown from this year. In one weekend we manufacture approximately 2000 lbs of explosives and are quite familiar with what they are, how they work, and the possible consequences of both their use and misuse. We both spend a lot of time outside of preparation for the main event with experiments and development of the mixture, targets, and other things both pertaining to the technical aspects for the explosives as well as the event itself. You do not actually need excess fuel in the form of gasoline to start a fire. Actually the chemicals involved in the explosive can cause a fire on their own. 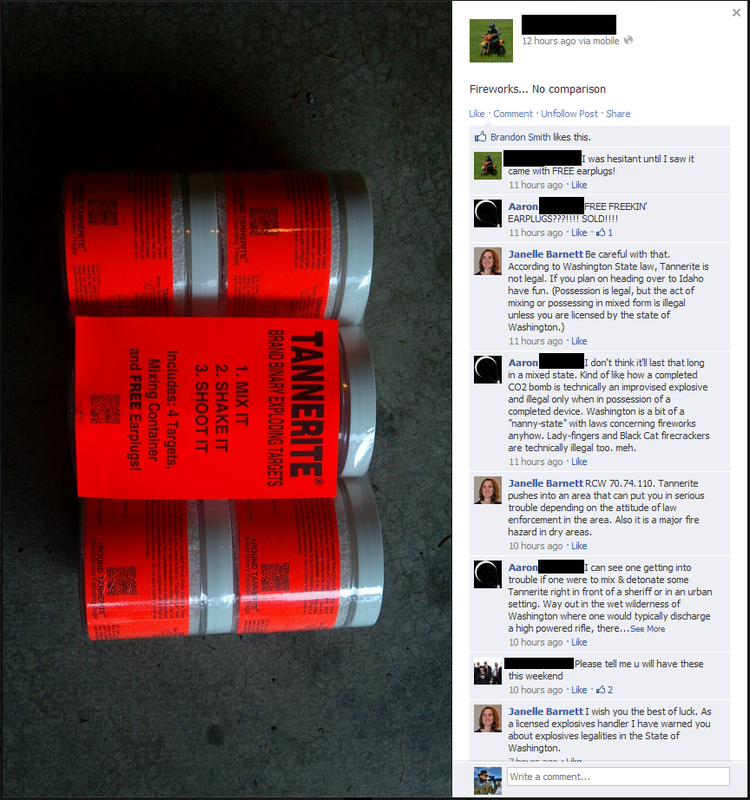 Boomerite actually can spontaneously combust when subjected to UV sunlight but your extensive knowledge of explosives has you obviously knowledgeable on that fact. 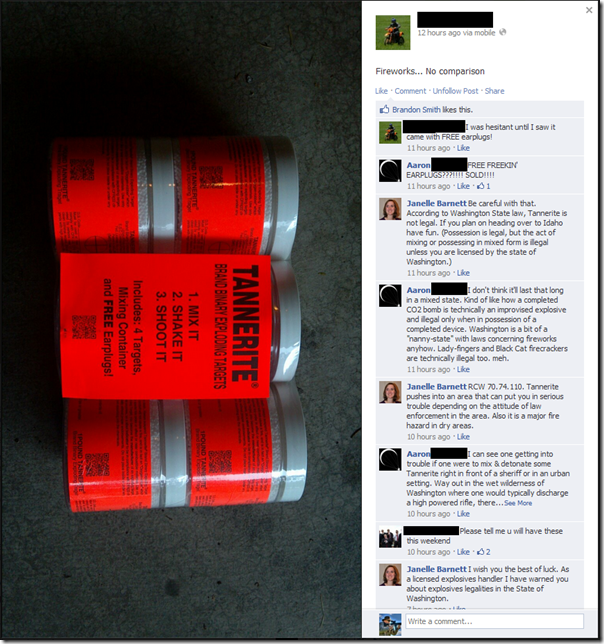 Do you know all the failure conditions for the materials involved in Tannerite to make your statement about fire not being an issue. Further no reaction is 100%, actually far from it. Some of the material from the explosion will not actually combust and be consumed in the reaction. These materials can be problematic as it can react with organic material as it breaks down. From a cursory inspection none of the materials immediately seem to be a fire danger but we thought the same thing about Boomerite. The bottom line is that explosions are caused by combustion and to cause them we use materials that are prone to combust, quite quickly. Yes reactive targets have been blamed for fires, including some recently here in the state of Washington. While I’m not sure that the targets were the cause, it is certainly a possibility and not outside the realm of reality. As a FYI when that happened, it was still relatively wet out here, still is actually. However that doesn’t change that you are actually within the fire season for the State of Washington, as well as Idaho. You can’t control the weather and just because things seem moist and safe doesn’t actually make it so. Further there are already numerous wild fires including one in Colorado and another in Montana. While further away, it should still serve as a reminder that caution and vigilance is important. Be careful, be aware, have a plan to put it out, and make sure to turn the soil where you detonated the targets after you’re done to separate and disperse components. But you, who knows so much about explosives were going to do that already. Right? Now on to my biggest point of contention. Washington is not exactly the friendliest of states with regards to explosives. As Janelle pointed out RCW 70.74 actually outlines many things that are prohibited regarding explosives. Including the fact that RCW 70.74.022 technically requires that any person mixing explosives have a license. While I fully and whole heartily sympathize and think it’s B.S. the law is still the law. It’s kind of funny that many of us whine about how congress critters ignore the law and then we turn around and do it ourselves. But that’s a level of irony for a whole different post. But you’re not going to be in an urban area so how would you be caught I hear you cry. I would hope to shout since discharging a firearm is illegal in most cities and townships. But you should know you are not safe just because you’re in the middle of nowhere. All it takes is for one person to see you and dislike what you’re doing and you’ll be in a world of trouble. Joe had problems because someone who was near a quarry he had permission to be at called the sheriff and the ATF. Joe learned of the situation after and an ATF Agent, not inspector (also known as the branch of Jack Booted Thugs), tracked him down and contacted him weeks after the incident. Note Joe has a license to manufacture and handle explosives and permissions to be on the property. Joe also knew inspectors on a first name basis with people in the same office as the agent. Joe had every i dotted and t crossed and was legal and clear in what he was doing. What cards do you have to play like that if someone doesn’t like what you’re doing? You will be in violation 70.74.022 and if they attempt to classify the explosive as a firework you will be violating 70.77.495. All it takes is some people trying to enjoy the wilderness that are disrupted by your activities and with a description of your vehicle you life can start rolling down hill. It takes a good prosecutor to convict a guilty man, it takes a great prosecutor to convict an innocent one. Given the overall destruction of Mens Rea three isn’t much the nanny state wont outlaw. Even given the fact that it’s nanny stateish I would be very careful about willfully or knowingly committing crimes, much less posting to Facebook about your intent and will to do so. That’s just not smart or bright at all. Especially since it can be brought out as evidence later showing you knew full well about the legalities involved. Will you probably get away without a problem? Probably. Does it have the potential to go south on you? Most definitely. Do you need to be prepared about the potential to cause a fire? Yes, even though it isn’t extremely likely it can happen. It may not even happen while you’re there but a day or two later. Be careful, know what you’re doing is dangerous and can have consequences that you’re not immediately aware of, and be prepared to deal with them because you are responsible. You would think that common sense would work, but common sense isn’t always so common. Instead of walking over people thinking you know more than them and just dismissing their comments for whatever reason, maybe you should just shut up and listen. They might have a reason for what they’re saying. So if you didn’t read it, a couple of months ago I wrote a root cause analysis on the causes and reasons behind Operation Fast and Furious, also known as Operation Gun Walker. ATF officials didn’t intend to publicly disclose their own role in letting Mexican cartels obtain the weapons, but emails show they discussed using the sales, including sales encouraged by ATF, to justify a new gun regulation called “Demand Letter 3”. That would require some U.S. gun shops to report the sale of multiple rifles or “long guns.” Demand Letter 3 was so named because it would be the third ATF program demanding gun dealers report tracing information. Think about that long and hard. These individuals broke the law willfully with an intent to create “necessity” for their new violations of the law. Their new violation of the law was the gun control they wished to implement itself as it is a blatant violation of the Firearm Owners Protection Act. Many have attempted to vilify the gun shops in this case saying they should have just not sold the weapons. What these people are refusing to acknowledge is the ATF, through their regulatory power, forced these shops to sell to people the would have otherwise not sold weapons to. Seriously, go read the CBS article, it’s is yet further evidence that validates my conclusions in the root cause analysis. Rochester police and federal agents made a mistake in Charlotte this week that has one woman baffled and frightened. She wants to know how they could mistake her house for one they were supposed to raid in a drug bust. Simple really, they don’t hire the best and brightest. Tyrannical bureaucrats don’t want enforcers who can think, much less read and tell the difference between the address on the warrant and the house they just arrived at. How close was this almost a fatal screw up for the ATF as well as the home owner? “My son had heard me arguing with this man and it was not a voice he’d recognize. My son is a hunter, he put a bullet in the chamber of his gun. They heard that, they yelled down long gun, at that point there he told another ATF agent that was with me, handcuff her and take her out,” Dominicos said. That’s the point. Law enforcement and the government want us to live in fear. Their actions exercise the very definition of the word terrorism. The best part of the story though is the discrepancy between the home owners story, which is considerably more believable, and the statement released by police. No you did not, you put her in cuffs and took her outside until someone bothered to read the house number and street name and noticed it didn’t match the warrant. Don’t give me the line about how serving a warrant is dangerous because the majority of warrants served are for non-violent offenses. When the criminal is actually dangerous, they negotiate him to come out to reduce collateral damage. There is the argument about the destruction of evidence, well if we weren’t serving warrants over victimless crimes involving nouns that wouldn’t be a problem now would it? Even better though, with the consistently increasing use of SWAT teams in unnecessary circumstances, the number of people caught in the middle who are innocent continues to increase. You can not use the service more and expect it to also become more accurate about it’s use, if anything it will become less accurate. No knocks, like the TSA, need to be done away with. They have both grown since September 11th and it’s eroding and destroying the last semblances of freedom and liberty. The police state is here and we need to put an end to it. Because it’s not the job of the swat team to read the warrant or make sure they’re at the right house. If there’s collateral damage, the law-abiding citizen should have just behaved, he had no reason to defend himself.